It's 6am and the local workers need their caffeine fix. You are the local cafe barista and see a horde of caffeine-needing zombies are coming your way. 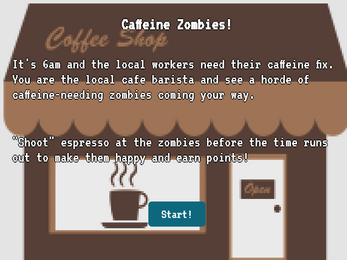 "Shoot" espresso at the zombies before they reach you at the counter to make them happy and earn points. They will gain points if you don't send them espresso and then leave angry. They need their caffeine!